Sock hops. Soda fountains. Slumber parties. 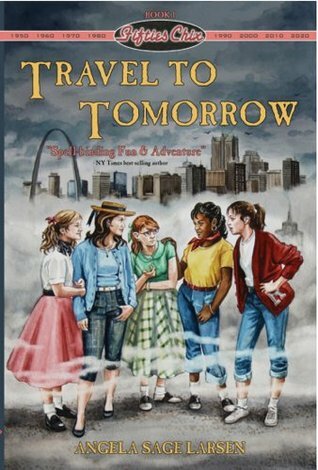 Life in 1955 is simple for tomboy Beverly, moody Maxine, high-spirited Judy, studious Mary, and artistic Ann. But after a class assignment to predict life in the future, they wake up the next morning in a future they could never have imagined, having time-traveled into a parallel universe over fifty years into the future. With only each other to trust, they must work together and find their way home to 1955, but the more they discover about the future, will they even want to go back? This book, which is the first in the five-book Fifties Chix series, did have a lot of period details–teens being respectful of their teachers, people watching I Love Lucy, students clutching stack of schoolbooks to their chests because apparently backpacks had not been invented yet –to gratify my imagination. Yet, the author did not overly romanticize the period, illustrating various stigmas attached to being African-American, Jewish, or divorced. The contrast depicted between the daily family life of the girls in the fifties vs. in ~2008 was fantastic. Family members in the 2000’s were more distracted with their cell phones and computers, and didn’t sit down to eat meals together. The mothers had jobs outside the homes. I LOVED how the girls’ surprise at this led me to ponder these changes. The chapters alternate focus on the different girls. The author did a good job of depicting girls who have diverse interests and personalities. I always like it in a book when characters initially can’t stand each other, as in this one in which the girls are initially thrown together to work on a class project, before becoming friends. I appreciated how they stuck by each other once they were friends. However, some of the girls are too wrapped up in boys for my taste. Worse, in chapter thirteen when Bev is living in modern times and playing on the boys’ baseball team, she attempts to get another player to like her by stroking his ego, asking him for batting tips. Ugh. Aren’t we (way) beyond this? An advertisement at the back of Travel to Tomorrow about the other books in the series: …What will happen with Mary, Ann and James O’Grady? Will Judy have her heart broken by Bob Jenkins? leads me to think that the girls will continue to be all moony about boys. Unless I find out this is not the case, I think I will probably pass on reading the other books in the series, because I just don’t find this story line exciting. At the beginning of the story I was distracted by grammatical errors, but if they continued I no longer noticed them as I became involved in the story. Also, I’m pretty sure some of the details weren’t historically accurate, but I won’t quibble. This would not seem to be a book that would appeal to boys. 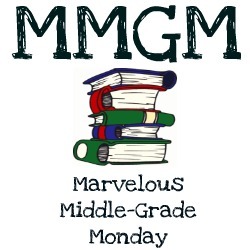 Check out more middle-grade book reviews at Shannon Messenger’s blog. This entry was posted in Book reviews and tagged Fifties Chix, kids' time travel stories, middle grade fiction, time travel books for children, Travel to Tomorrow. Bookmark the permalink. Great idea for a story and one that would be hard to pull off. Seems mostly successful here. Thanks for bringing this book to my attention. I really love time travel stories like this where the protagonists travel from the past to our time. It always makes for a lot of humor. I love this premise and the 50s. Exactly–good writers writers of time travel fiction capitalize on that humor. Thanks for the reccomendation! I love evrything about the fifties and often wonder what it would be like if people from the past could see our world now. Will definitely be reading this in the future! Interesting concept. And does this take place in St. Louis? Because I spot the Arch on the cover! I can understand why they’d be boy-crazy if they’re from the fifties, but I can also see how that would be off-putting as a modern reader. I’d be interested in hearing if that focus does continue in the rest of the series. You know, I saw the arch too, but I don’t remember any references to St.Louis. Maybe in the rest of the series?